Multi-select tabs have been enabled by default on Nightly! Please test it out and file bugs! There’s a spiffy new animation for the tracking protection icon in the identity block. AwesomeBar autocomplete fixes have been uplifted to 62. Please help us test it by reporting bugs where you’d expect an origin to be autofilled, because you use it often, but it’s not. Shipped on Android. Up next, we’re triaging, responding to early feedback and meeting with the Applications Services team to figure out next steps for the Notes experiment. Social media response (Twitter, Hacker News, Reddit) relatively positive! Next week: we kick-off Android app planning! Kanika Saini is working on about:policies and other parts of our Policy Engine! Kris fixed an issue with filterResponseData that broke window.onload in XML documents in Firefox 61 (possibly considering for 60ESR). Peter Simonyi fixed a bug in menus.onShown when the context is a bookmark (possibly to be uplifted to 62). …and have the timestamp in milliseconds. Ian Moody fixed a devtools regression that was introduced in 61 (to be uplifted to 62). Aswan enabled the delayed background page startup on all channels (was just Nightly in 62). Luca fixed a bug with extension storage, as part of the move to IndexedDB. Smaug made extensions work with shadow DOM/WebComponents. Oriol made it so that browser.tab.highlight() with a single tab does not set multiselected to true. Shane updated tabs.onUpdated filtering to use isArticle instead of isarticle. Mkaply cleaned up the search API. Started work on turning Activity Stream into a component (meta bug), primarily moving init from bootstrap.js to a JSM, then moving packaging from feature to browser.jar. Implementing New Tab Page background and text color properties. Switching remote tippy top site data to use RemoteSettings. Getting about:welcome ready with a bunch of fixes. Automated code analysis is now running in Phabricator. ClientStorage work (which should help lower the jank on the compositor on macOS) is nearing completion. One more patch to get reviewed! Working on enabling the Activity Stream content process – just working through some test failures. Made browser resizing with devtools open smoother, also here. 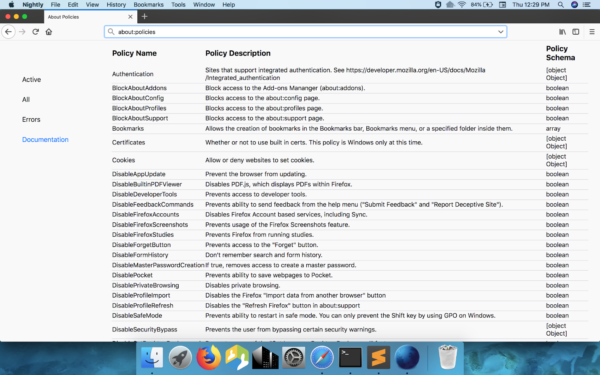 Here’s a sneak peek of the new about:policies! Follow us on the Meta-Bug, Front-End Meta Bug, and FastBlock Meta Bug. Baku added a pref that allows us to block storage access for third party trackers on the TP blocklist, unless they have user interaction. 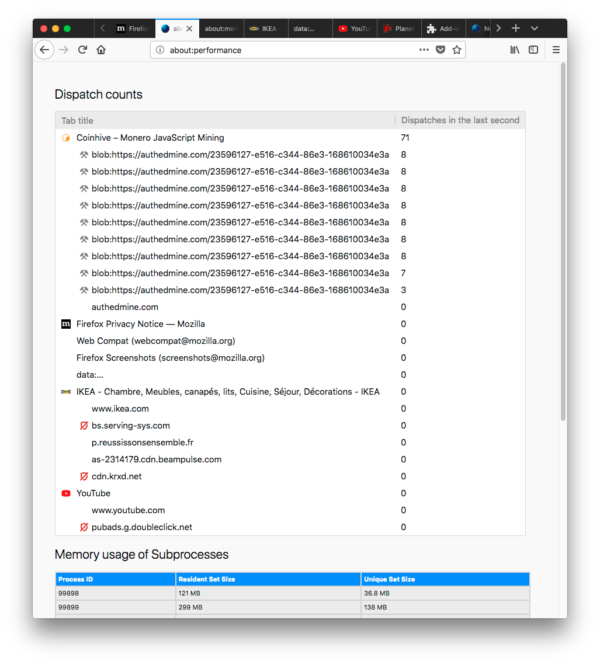 The Firefox Monitor shield study (bug) has finished and we’re evaluating the results. We are replacing nsIDownloadHistory with the async History API, and removing page annotations, to make the downloads views faster. We are reducing the maximum favicon size from 256 to 192px. To shrink the favicons database size a bit, since nobody is using 256px icons in the UI. Fixed a formfill autocomplete bug on the Google login page. Formfill will now act on keydown, rather than keypress, disallowing pages from bypassing it. There is a known issue on Windows 10 with the Antimalware Service slowing down the system when Firefox is running. A new Defender version, expected to solve the problem, should be available in the next weeks. SQLite now uses an exclusive locking vfs on Linux. This prevents some SIGBUS crashes and makes SQLite work more reliably on nfs filesystems. On the other side, it’s not possible anymore to access SQLite databases while Firefox is running. If you work with SQLite in Linux and need concurrent access to debug, you can create a boolean storage.multiProcessAccess.enabled pref and restart the browser. Carol fixed the threading model in the FxA client component for Fenix 🎻. Ed is removing dependencies on C libraries in Sync.next, preferring pure Rust libraries where possible 🦀. Thom is continuing to work on a Sync Logins API in Rust for Lockbox 🔐. Mark is working on a strategy for shipping the Sync.next Rust library in products 🚢. Lina fixed a bug where moving bookmarks between folders wouldn’t move them on other devices, and changed the bookmarks mirror to be snappier 📚. Design intern Vicky is working on a complete UX overhaul for Color so we can replace Personas Plus which will be retiring soon. Working with Platform to allow much larger file transfers via the WritableStream API. We hope to release a completely overhauled product experience when Streams are pref’d on in Firefox. Closed a ton of last minute bugs to make sure mobile launches were successful. 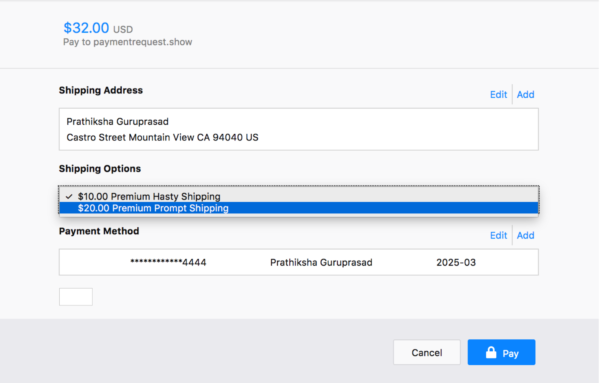 Prathiksha landed native <select> dropdowns. Dropdowns are going to be polished in a follow-up patch. Sam is implementing error pages and handling the user closing the dialog with the native window controls, on platforms except macOS. Jared is breaking down work required to continue using a window modal PaymentRequest dialog for the MVP so we can compare to the effort required to build a new tab-modal widget. MattN reports that header and footer visual polish has landed. The team is now working on payment card add/edit page improvements. Keep up with developments in other browsers by following @intenttoship, @ChromiumDev, and @MSEdgeDev! Remember Services.[c|p]pmm.initialProcessData? Introducing Services. [c|p]pmm.sharedData, a better solution! Check out Prathiksha’s intern presentation about her work on Web Payments! Just about ExtensionStorageIDB / indexedDB.